Who better than a vaudeville vamp to chart the life experiences of a self-proclaimed “lush,” and the lifestyle choices of a dive bar diva? Christa Hughes creates a highly-believable character: the woman at the bar who wants you to buy her another drink, who has been the life and soul of the party, and who is gradually falling off the bar stool of life. All in one night. Think the best of German cabaret, with a good dose of Australian self-deprecating humour and close observation; add an experienced pianist and serve with a great voice. The show is well-researched and, as Hughes notes, “educational” (particularly when it comes to describing the hangover experience). The extent to which alcohol references dominate popular film, television and advertising are ably demonstrated—requiring a depth of research, and perhaps being one of the better sobriety tests around. Indeed, the rapid-fire lip-synch of alcoholic references from film and TV we know and love (although only the most devoted of fans will have been able to identify the films) was only surpassed by the advertising-medley encore. The set list includes a number of songs written by Hughes, including a version of My Favourite Things that Julie Andrews definitely would not recognise. Whiskey Trail and The Stink of Desperation are unlikely to be chart-topping, but both were beautifully-crafted and performed. Pictured: Christa Hughes, with pianist Leonie Cohen. Picture Credit: Creative Futures Photography. Hughes’ own songs were good, but her performances and reinterpretation of some classics were definite highlights. 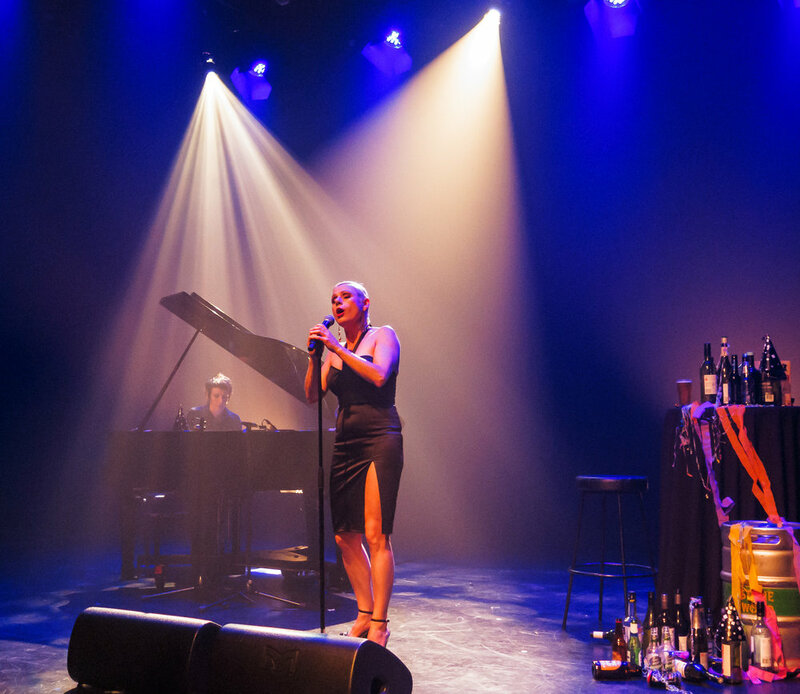 It is difficult to identify a single favourite among the songs, but Lilac Wine (Shelton) had to be in the top three—showing off the skills of pianist Leonie Cohen, as Hughes brought out the meaning of the song in a poignant and heartfelt way. Cheap Wine (Cold Chisel) was an audience favourite, and Hughes’ performance brought the words to life in a very funny way. Is That All There Is? (Peggy Lee) and The Piano’s Been Drinking (Tom Waits) were funny and sad in equal measure. Amazing to discover that this show was first written by Hughes back in 2000. Let’s hope that the final show in the 2018 Wonderland Festival is not the last time this Beer Drinking Woman is garnishing cabaret calendars. If you don’t have plans for tonight, book your ticket now. Verdict: Funny, bawdy, boozy—mixed together with a great voice. Audience tip: 60 minutes, Brisbane Powerhouse Visy Theatre (15+. Light smoke/haze effects, coarse language, sexual and alcohol references). Drinks purchased at the bar can be taken into the show. There are only three performances of Beer-Drinking Woman in the 2018 Wonderland Festival program (22-24 November, 2018). Tickets may still be available for the 24th November show (7:30pm) $39 ($32 concession, $35 pp for a group of 8+) plus $5.95 transaction fee. Why not keep an eye on the website, and see what else might tempt you at the 2018 Wonderland Festival. The reviewer attended the Friday 23rd November 2018 performance (7:30pm).